Listening to N.W.A. and N.W.A.-spawned artists can be...problematic. But lest you feel like you can’t enjoy one of the seminal groups of rap music and pop culture at large, it helps to remember they made a few songs wherein they did not rhapsodize beating, killing, or sexually assaulting women. Here is a list of good songs that don’t make you feel like a woman-hating shitheel. 9. If It Ain’t Ruff - N.W.A. 5. Real Niggaz Don’t Die - N.W.A. 3. It’s Funky Enough - The D.O.C. 2. 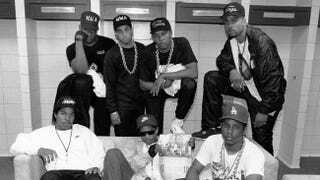 100 Miles and Runnin’ - N.W.A.